Installing solar panels is an expensive, laborious process, a fact that keeps many homeowners from making the switch. But what if, in the future, there was a cheaper, less complicated method of generating solar energy? What if that solar energy source came in the form of paint? Well, that future is actually not as far off as you might think. Solar paint, also known as photovoltaic paint, is exactly what it sounds like! It’s a paint that you can apply to any surface that will capture energy from the sun and transform it into electricity. The paint would essentially be your average paint, but with billions of pieces of light sensitive material suspended in it, material that would transform the typical paint into superpowered energy-capturing paint. The cool thing about solar paint, as far as residential homeowners are concerned, is that installation is much easier and cheaper. Do you know how to paint? If so, you can do the bulk of the installation yourself! An electrician will obviously be needed to pull everything together, but you won’t be needing a full installation team working all day on your roof like you currently do with traditional solar panels. What is the Current State of Solar Paint? Right now, solar paint is a little bit more than a concept and a little bit less than a consumer-level product. Many universities and some research groups have created their own iterations of solar paint, and some of them have had some serious success! We’ll cover those successes in the “Types of Photovoltaic Paint” section below. Solar paint is certainly less expensive than solar panels, in terms of both production and installation, but the low efficiency means that it’s not quite ready to be taken to market. However, we still think it’s quite amazing that the technology exists at all. 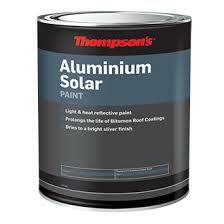 The widespread usage of solar paint is not as far off as it may seem! At the University of Buffalo, they have utilized an organic photovoltaic material that, like the dots, can also be placed in a paint and applied. However, the efficiency is still lower than needed to make it a realistic option for homeowners. In 2015, a startup called SolarLayer attempted to fundraise for their brand of solar paint on IndieGoGo. They didn’t go into what their solar paint was actually made of. Perhaps this is why they only raised $400 of the initial $100,000 goal! In the end, solar paint is still a technology in its infancy. But we have to remember that not too long ago, solar panels were at the same stage. The solar industry is a progressive industry that is always looking to improve its technology, and if I were a betting man I would say that solar paint has a good chance to become a legitimate option in the solar space before long.